Tour will involve two nights’ in Mikumi National Park. Early morning pick-up from your chosen location, hotel or accommodation in Dar es Salaam, and drive to Mikumi National Park which is approximately 6 hours from Dar es Salaam. The drive is through some arid vegetation characterized by African Savannah and scattered acacia. You will arrive at your lodge or camp in time for hot lunch then after lunch you will proceed with the game drive till evening-viewing animals such as Elephants, Lions, Giraffe, Buffalo, Warthog, Wildebeest, Hartebeest, Antelope, Hippos, Crocodiles, Pythons etc. Drive back Vuma Tented Camp (lodge above midrange) or Tan-Swiss Lodge (midrange lodge) or Camp Bastian(Budget lodge) in Mikumi for dinner and overnight. Full day game drive around Mikumi National Park. The park is very rich in varieties of bird species as well as large numbers of giraffes, buffaloes and elephants and close to the water holes also Lions, Leopards and Hippos. 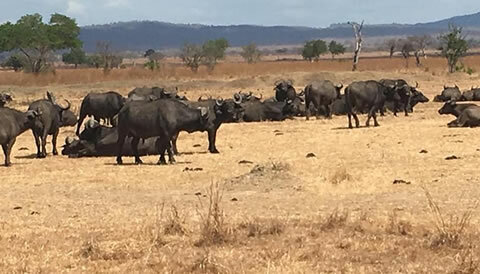 Moreover, you can see other interesting animals like Zebras, Lions, wild dogs, Pythons, Hartebeest, Wildebeest, Elephants, Impala, Warthog, Eland and other Antelopes. Drive back Vuma Tented Camp(lodge above midrange)orTan-Swiss Lodge(midrange lodge)or Camp Bastian(Budget lodge)in Mikumi for dinner and overnight. Morning breakfast, then drive back to Dar Es Salaam for drop off at your hotel or airport.